So you have the file in your Dropbox folder that you edit on your computer. You update it regularly, and you want to import that file to Shopify every day. This is how you set up that regular daily import automatically. Save your file to Dropbox. Paste your Dropbox link in the app. 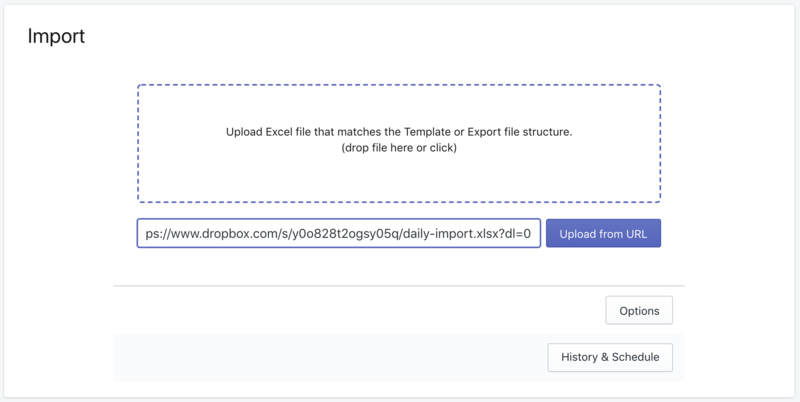 Schedule the regular import from that Dropbox URL. Now, let’s dig into details of each step. You know that green checkbox icon which means that the file is synced to Dropbox. That’s it – just make sure you have enough space on your Dropbox cloud storage, and that the file is really syncing. 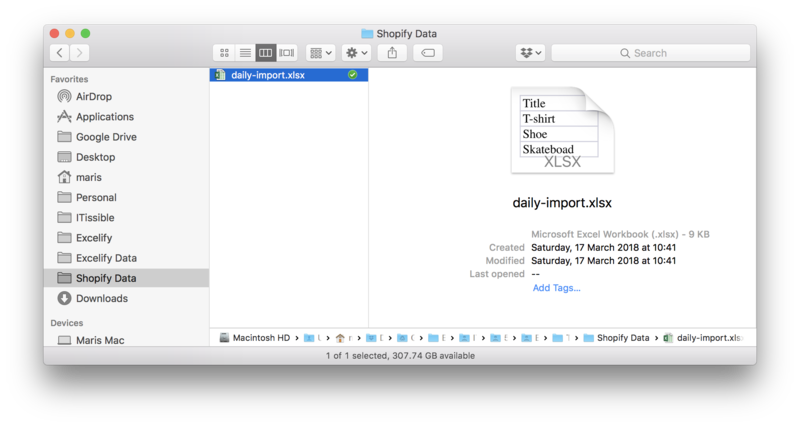 Open the “Bulk Import Export Update with Excel” app in your Shopify store. Scroll to the “Import” section and paste that URL there. Then press the “Upload from URL” button. It will upload the file and analyze it for the first time. Don’t press the import here just yet. And set up the scheduled time in your Shopify store time zone and repeating intervals. Also, you might want to remove the checkbox from the “Stop if images cannot be downloaded for updated items.” so that the import doesn’t stop in case it will not be able to update images. Notice the “Take import file from URL” – it points to your Dropbox file link. That means the app will download the fresh file from this Dropbox link each time when doing the next scheduled import. Now, press the “Schedule Import” button. If the scheduled time will be today and time will be already passed, then the today’s import will start shortly after you will schedule it. You can see the progress of all your scheduled imports and exports in the “History & Schedule”. You can also cancel any of those jobs from there. You can download the import results file from there, too. The scheduled time is in your Shopify store time zone. 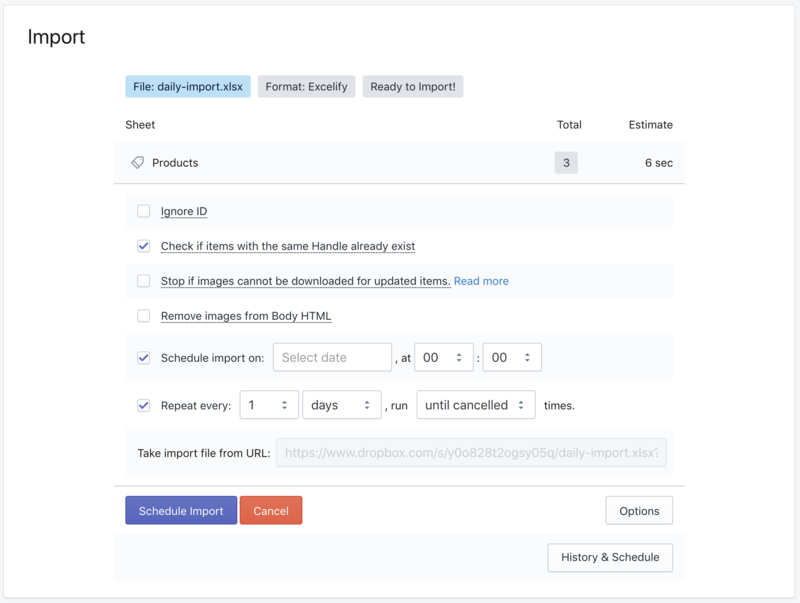 You can also schedule import files to Shopify store from FTP and Google Drive the same way. 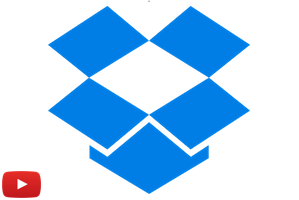 You can also import files from Dropbox manually – by just pasting that Dropbox link. That will make your file upload much faster because you will not need to upload the file from your own computer. Import not only Products data – import and update any of supported by Excelify.io formats.